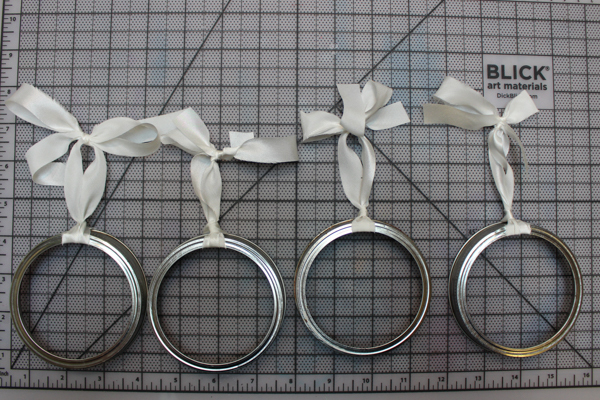 If you enjoy canning, don’t you have SOOOOO many Mason jar lid rings? Those Mason jar lid rings, also called screw bands, can be re-used (unlike the lid tops, which you aren’t supposed to re-use at all), but only until they start to rust or get bent or dinged, something that seems to happen with my rings, at least, after very few uses. Fortunately, there are loads of ways to repurpose these rings so that you’re not just adding them to the waste stream. And since it’s December, my favorite way to repurpose ANYTHING this month has to be Christmas ornaments! 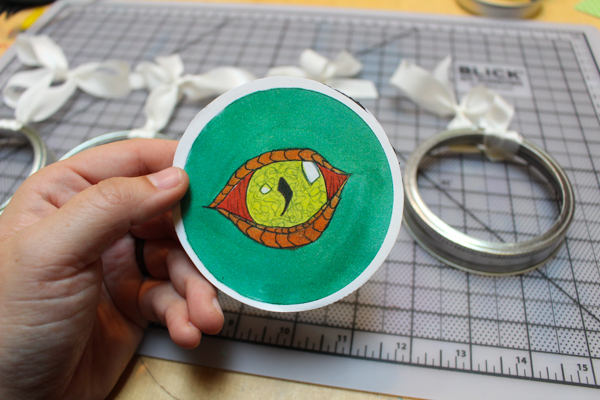 These Mason jar lid ring Christmas ornaments look a lot harder to make than they are. If you’re artistic, you’ll love using these to show off your skills, but even if you’re not–hey, that’s why clip art, stickers, and patterned paper were invented! Mason jar lid rings. Repurpose ones that are no longer suitable for canning. Don’t can? You know someone who does, or check on Freecycle or Craigslist–there is someone out there who would LOVE to give you their dinged-up canning supplies. Ribbon. Stash ribbon is fine, but twine, hemp cord, or even thin chain would work. Mat board or thick cardboard. For these particular ornaments, I used mat board scraps (does it still count as hoarding if you really do use the stuff someday? ), but thick cardboard–something thicker than card stock or food packaging–would also be fine. Decorative paper. Use scrapbook paper, old book pages or sheet music, or even wrapping paper. Image for the ornament’s front. My daughter traced the inside edge of a Mason jar lid ring, then created several pieces of original artwork for our ornament fronts, all of which I photocopied onto card stock so that we could make multiples. Anything fun and creative would make a beautiful ornament, however. If you’ve got scrapbook supplies, dig them out! Spray paint (optional). It’s not eco-friendly, but if you want to change the color of your Mason jar lid ring from rusted metal, this is your best option. 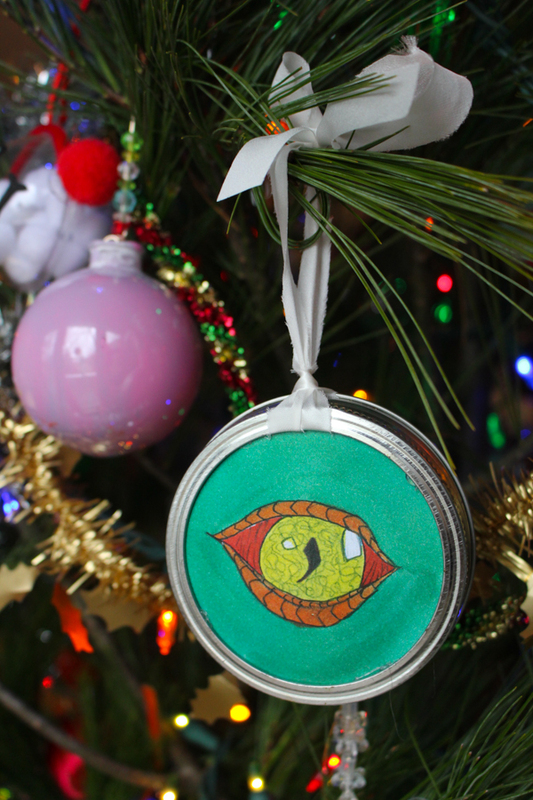 I’ve made these ornaments both ways, and while I do like the painted ornaments better, it’s not necessarily worth the time that it takes to paint them. Glue. You need an archival glue suitable for paper and a separate, sturdier glue for the rings. I used spray mount for the former and hot glue for the latter. 1. Trace the inside edge of a Mason jar lid ring. This will be your template for cutting the decorative paper back, the mat board middle, and the featured image on the front. 2. Make a beautiful ornament front. The Mason jar lid ring makes the perfect frame for your original art. Whatever medium you prefer, whether it’s watercolors, acrylics, markers, or charcoal, it will look adorable in this simple round frame. But don’t forget that you can also use stickers, cut-outs, clip art, or anything else you’d like in order to embellish these ornament fronts. 3. Cut all pieces to size. The ornament front, mat board or card stock, and ornament backing paper should all be cut to your template. You can pop them into the Mason jar lid ring to check the fit–sometimes I’ve found that I haven’t cut a piece carefully and have to trim it a bit. Better to do that now than when you’re racing the hot glue gun! 4. Glue the ornament front, middle, and back together. Spray mount gives the most archival result, but an ordinary glue stick is also perfectly serviceable. 5. 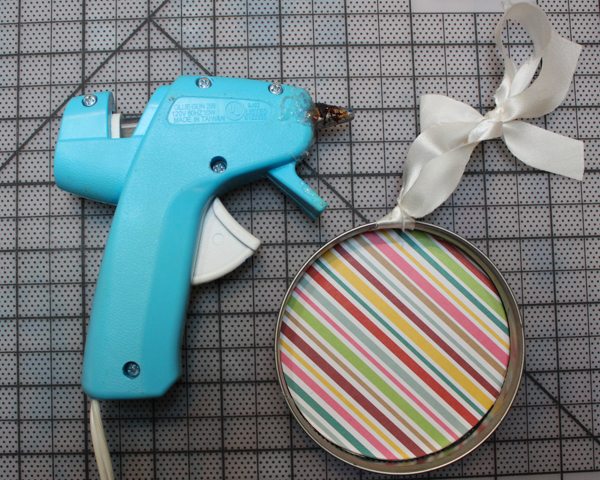 Do you want to paint the Mason jar lid ring? If so, do it now! Spray clear sealant, with or without painting the rings, is another option. 6. 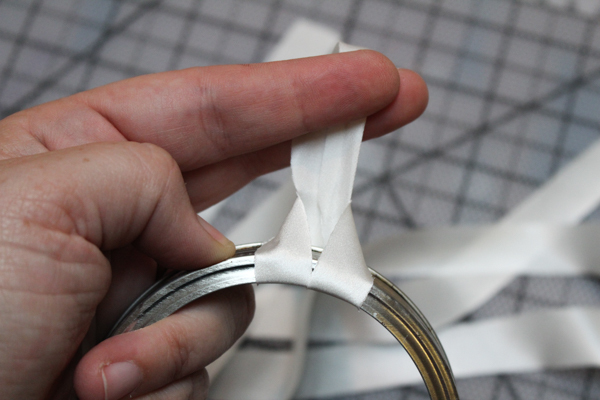 Tie ribbon onto the Mason jar lid ring. A lark’s head knot is just about the easiest and most attractive of knots, and that’s what you’re going to do here. Tie the ends of the ribbon into a bow, and there you have your ornament hanger! 7. Glue the ornament piece to the Mason jar lid ring. I’ve tried several types of glue with this ornament, and none are really ideal. The most full-proof glue is hot glue, but you’ll have to work quickly. Lay out the ornament, face-down, and the Mason jar lid ring, flat side down and with the ribbon at the top, and then quickly dispense hot glue around the inside edge of the lid ring. Immediately set the ornament into the lid ring and press it down so that it’s flush against the flat side of the lid ring. 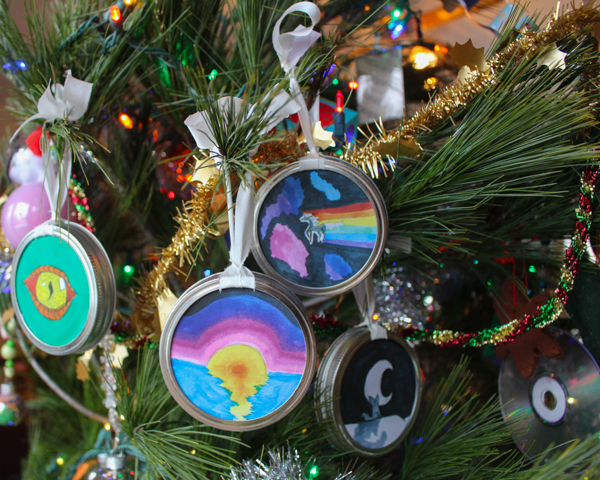 These ornaments are a great way to show off a kid’s artwork–or your own! A matching set of complementary ornaments also makes a nice handmade gift. But of course, I like them best on my own tree, displaying all of our homemade love for the season.